The Hippus Handshoe mouse isn’t just big, it’s huge. It looks like a mouse that got melted onto a plastic dinner plate during a fire. Seriously, this thing dwarfs even my large Contour Mouse, and makes ordinary mice look like little bugs. Once you get over the shock of its size and start using the Handshoe, it’s amazingly relaxing. It’s not just a pointing device; it’s a comfy place to rest your hand while working. Its contours are designed to fit your hand just like a shoe fits your foot. This design is very effective, for me at least. When my hand is at rest on the Handshoe, every part of it rests comfortably on a corresponding part of the carefully designed surface. Unlike almost any other mouse, the Handshoe is big enough to support your entire hand, so you don’t touch the desk at all. You can let every bit of tension out of your hand and fingers, and still be able to control the mouse using your forearm and elbow. Controlling the mouse from your forearm doesn’t come naturally to everybody; some find it a difficult adjustment. We’re used to maneuvering standard mice with our wrists, but this is bad for them (the wrists, not the mice). 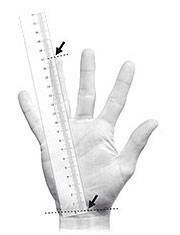 Forearm control allows the wrist to remain straight, but there’s a tradeoff in movement accuracy. The key is to start out by turning your mouse pointer speed way down in the Windows control panel. As you gain facility with a forearm-controlled mouse like the Handshoe, this speed will start to feel slow and you can turn it back up. I had a bit of trouble with choosing a size, because my hand is right on the line between large and extra-large. After much thought, I decided that too-big would be better than too-small and asked for the XL. Much to my surprise, Hippus sent me review samples of both, which is what I call proactive marketing! After trying both the large and extra-large mouse, my theory was confirmed – the extra-large felt more comfortable. The large felt okay, but it let my fingers drag a little on the table. Hippus claims that this is all right, but I find the mouse much more relaxing when the whole hand, including finger-tips, is well clear of the desk. UPDATE 04/01/2013: Hippus no longer offers the XL Handshoe, or any model with three buttons. For you southpaws out there, Hippus does have a lefty version of the Handshoe available. The Handshoe user guide is short, but it makes one thing very clear: Don’t let your arm hang loose while using the Handshoe mouse. I’ve heard more than one opinion on the subject of arm supports, but for myself I have to agree with Hippus on this one. 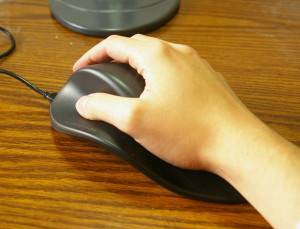 Using a large mouse like the Handshoe without a chair arm is asking for tired, sore muscles from neck to wrist. Unlike some specialty mice, the Handshoe seems quite durable. The scroll wheel is smooth but firm and the buttons, while easy to click, feel sturdy. As long as you don’t do something silly with the mouse like swinging it from its cord or letting the dog use it for a Frisbee, I can see it lasting for several years. The finish is matte, not gloss, so it feels nice to the touch and doesn’t show fingerprints. 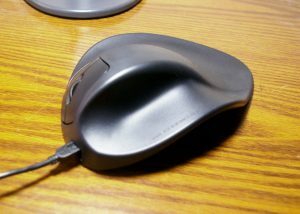 If your current mouse is clinging to a small corner of your desk, some changes will need to be made. The Handshoe has a big enough footprint to completely cover some mouse pads, leaving no room at all to move the mouse. Personally, I’m not a big fan of mouse pads anyway. They’re a leftover from the bad old days of ball mice, which actually needed friction to operate. 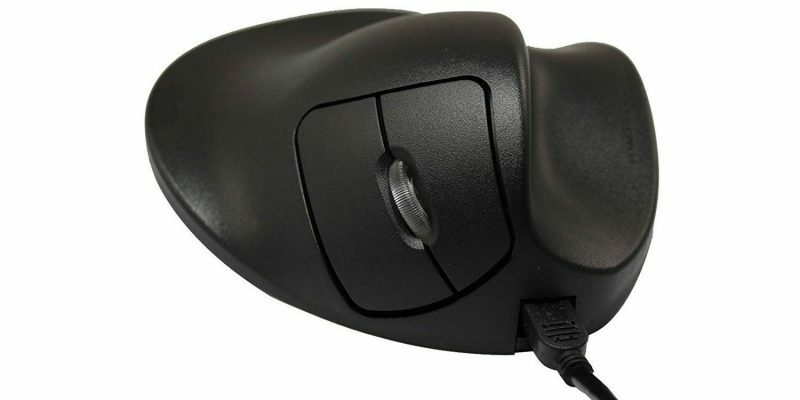 The Handshoe, like all current mice, is optical. If you have a reasonably smooth desk surface, I suggest that you throw away your mouse pad and clear an area at least 10″ wide, more if you can manage it. To get the space needed for the Handshoe mouse, you may even have to switch to a narrower keyboard. I think everyone should consider doing this anyway – the numeric keypad on a standard board simply pushes your mouse too far away. If not, it causes you to move the keyboard itself, placing the leftmost keys out of reach and twisting your wrists. If you don’t need the numeric keypad at all, you can buy a keyboard without it, like one of these narrow models. If you use the numeric keypad, Logitech’s affordable K300 compact keyboard has a smaller footprint without giving up ten-key. I have one of these Logitech keyboards myself, and while it’s not my favorite, it totally beats a standard board. Trying to operate the Handshoe mouse without sufficient space can be a little frustrating. I know this from experience, because I’m doing it right now on the platform I normally use for my smaller Contour Mouse. Every so often, the Handshoe bumps into the keyboard and I have to pick it up to reset its position. Only it’s hard to do that, because there’s no great way to pick this mouse up with one hand. The best I’ve been able to do is rock the mouse to the right and scoot it over – less than ideal, but it works. Do yourself a favor – make room, and keep it clear. The Handshoe is worth it. The Handshoe may be the world’s biggest mouse, but Hippus has tried to make it portable as well. This is good in case you want to take your Handshoe back and forth from work to home, or on trips. The cable on the wired model is removable, something I have never seen on a mouse before. It’s not even a special cable, just an ordinary mini USB on one end and standard USB on the other. You may find that winding up the cable separately makes the mouse more compact for travel. Of course, if you choose to pay a bit more and get wireless, you won’t have to worry about the cable at all. There’s also a cloth drawstring bag, not of the highest quality but still a nice touch. The box, too, seems designed for reuse in storage and transportation, so you have some options. One reason I chose the extra-large instead of the large is that you get an additional button. I’m a big fan of center-click and I don’t like having to smash down on a small mouse wheel to get it. Unlike other mice with extra buttons, the Handshoe doesn’t come with any software to change the way they work. Everything is operating system default. So, on Windows, you have left, right, and center click, with center click being both the scroll click and, confusingly, the rightmost button. In a way I wish the buttons were programmable like those of the Evoluent vertical mouse, but in another way I’m kind of glad they aren’t. On some devices, it’s just too easy to keep customizing forever. 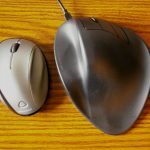 If you mostly do ordinary computer tasks that don’t require pixel precision and want to protect your dominant hand, you really should try the Handshoe mouse. It may look like a clog sitting up on your desk, but it’s a pleasure to use. Highly recommended! Disclosure: This review was made using a sample from Hippus, which I returned to them after finishing the review.